Alpine Cycling Club Junior Program has been running for many years and is constantly evolving to offer the best opportunities for our up and coming riders. The Program runs for Term 4 and Term 1. 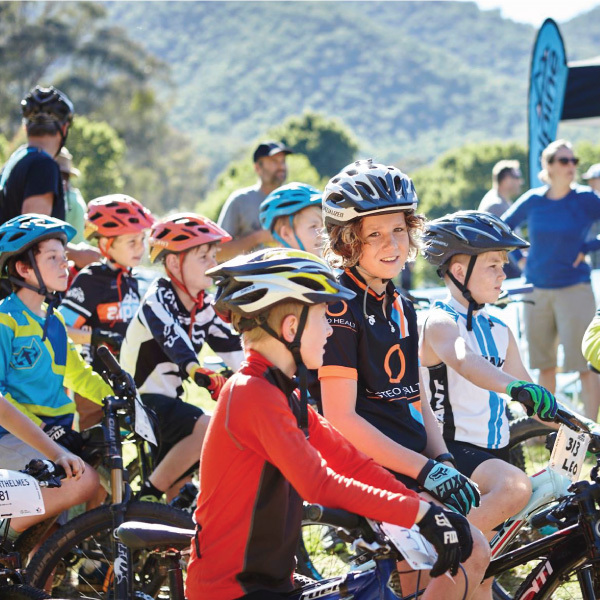 Make sure you have a current MTBA “Dirt Master” Licence (for 4-13 year olds) available at Mountain Bike Australia for riders over 13 a Recreational Licence will be sufficient unless they plan to try racing in which case we would recommend taking out a race licence. This link will also allow you to pay your club fees in the same transaction. Click here to register with the Junior Program – order your t-shirt and personalised nameplate. Tuesday Junior MTB rides are a great social ride for junior riders of all abilities, there will now be some skills coaching incorporated into the Tuesday night rides depending on the skill level of the group. There are regularly over 80 kids from 4 – 15 riding each week so please have your kids at the Alpine Cycling Club in their group around 4 pm, ready to ride away at 4.30pm during Terms 4 and 1. 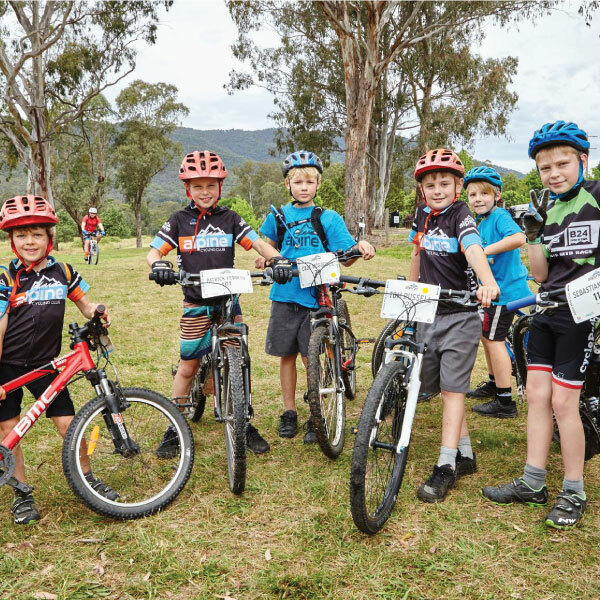 Ride groups are based on age, ability, fitness, friendships and riding interests, it is important that kids ride with their designated groups so that we can keep track of everyone and maintain ratios. Our aim is to keep the group sizes at 8-10 junior riders with two leaders so we always need extra adults to help out on our rides – if you are interested in helping out, please email juniors@alpinecyclingclub for details. Your child will receive a personalised nameplate, please ensure that emergency contact details are written on the back of that plate and it is attached to their bike every time they participate in club activity. All children must carry a drink bottle or a small backpack with water and wear close-toed shoes for all riding activities. Please make sure that your child’s bike is in good working condition every time they ride, simple things your child can do every week are to check their tyre pressure, clean and lube their chain, check that brakes and gears are working and make sure there are no loose bits. Information about cancellations or changes to the program will be emailed to junior club families and posted on Bright Cyclists and Alpine Cycling Club Facebook page. Alpine Cycling Club respects the right of all children who are members of the Alpine Cycling Club or who participate in Club activities to have the right to feel and be safe. We are committed to the safety and well-being of all children and young people accessing our Club. A great opportunity for juniors of all abilities to have a fun day, learning some new skills with qualified coaches, tricks, playing MTB games and fun races. Sunday 21 October 2018 at Alpine Cycling Club Rooms, Coronation Avenue, Bright. Entry fee is included in Alpine Cycling Club Junior Program registration fee or $30 for non-members plus $7 for MTBA Day licence if you do not have current MTBA licence. The Junior MTB Race Series is a great way for junior riders of all abilities to have a go at racing in a fun and friendly atmosphere; courses are set to be suitable to different age groups and whilst some will be racing to beat their mates, others will be there just to have a go and maybe win a lollipop. Once again one of the races will be held at the Beechworth MTB Park, a great opportunity for Alpine riders to ride different tracks. All juniors are welcome to race our series, and we are always happy to have visitors come along to our events, they just need an MTBA Licence or to purchase a day licence. Series prizes are sponsored by CyclePath Bright. Registration is $10 per race or $40 for the series of six races. Congratulations to Simon ‘Reggie’ Jones for taking over running the Junior MTB Race Series this year which saw a great turnout to all the races once again, though we didn’t have many Under 5’s this season. The Beechworth round is always a favourite, giving Alpine riders an opportunity to ride at a different MTB Park and race against juniors from another club. It is always great to see lots of juniors coming along to have a go and throughout the season there were visitors from Melbourne coming along for a hit out with the local kids. A huge thanks again to CyclePath Bright for supporting our junior program by donating series prizes.